We’ve just returned from this years Cornwall RV, and it was AWESOME! The weather was (mostly) perfect, the vibe was very laid back everyone seemed to have a great time. Not being able to distance myself from food too much for fear of, I don’t know, starvation maybe, I spent most of the weekend selling burgers & bacon butties in the HQ kitchen. When I was let out of the kitchen for good behaviour, it was to arrange an Easter Egg Hunt through the woods and to hold a bread making class for the kids. This year we used this really simple flatbread recipe that we cooked on a skillet over an open fire. Of course it can be cooked at home either on the hob or under a hot grill, but as everything tastes better cooked outdoors do give it a try if you can. The measurements below are about as loose as you can get, so don’t feel you have to stick to them. Don’t skip the salt as it’ll be pretty grim without it, but if you don’t have any oil or butter to melt it’s not the end of the world. With enough chocolate spread on I’m sure the kids won’t mind! Here’s hoping you all had as much fun as we did this Easter! Pop all the dry ingredients in a large bowl or large ziploc bag. Pour in the oil then add the water slowly, stirring the bowl or massaging the bag as you go. When you have something that looks vaugley dough like, tip out onto a lightly floured board or table and roll or press into as evenly thin as possible. If it looks too wet and is sticking to everything, add more flour. If it is dry and crumbly, pop back in the bowl or bag and add a bit more water at a time until it looks smooth. The kids love to shape their breads into all kinds of shapes, but by keeping them thin and even they'll taste much better as they'll be cooked evenly. The other bonus of rolling them really thin is that they'll be bigger so they can fit more chocolate spread on! Heat up a skillet or frying pan on the fire or gas stove and add a little dash of oil. You don't really want a lot of oil in there, just enough to stop the bread from sticking. Cook each flatbread for a couple minutes, until the dough puffs up with fat bubbles and the bottom looks golden brown in places. Flip over and cook the other side. Spread with oodles of chocolate spread and devour greedily. How lovely Jane! Your post makes me so desperate to escape to the country rather than our London flat. Aww, you’re welcome to join us round a campfire anytime Helen! Absolutely GG, it’s amazing how much more everyone eats when camping too. All that fresh air does crazy things to appetites! Great idea! I now have the urge to go camping. I miss being in the outdoors. Do it! We had SO much fun & I can’t wait till our next trip now! this looks so much like chappati dough and I love the rustic way to roll them with bottles , pans hands.great way to get in and cook and EAT. You know what, I remember my mum teaching me how to make flatbreads on a campfire. We used to camp a lot when I was a kid, though I was pretty reluctant hiker! 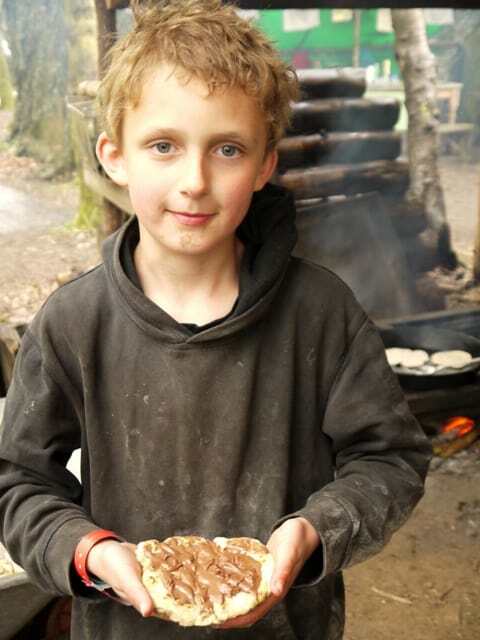 Had to laugh…first instruction Wash their hands.haha,thought bread making got them lovelly n clean..Love the picture of kid with chocospread allover his face.sure there were many more.But thats whats nice about Bushcraft,etc.The kids get back to the simple pleasure of yesteryear!! Janie you must have the patience of a saint,with all of them!!! I think coiling around a stick is also a good one for kids. Yes, the coiled bannocks are great fun but I wanted something that would cook quickly without them (or me!) having to get too close to the flames. Nice one Janie! Was planning on making flat breads with kids myself, maybe ones who’ve washed a little more recently, and this recipe is spot on, thanks so much. Can’t beat a slather of choccie spread either! Love flatbread and the kids look like they enjoyed it. Everything really does taste better outside! Great pics of our boys,thanks! these look seriously good. 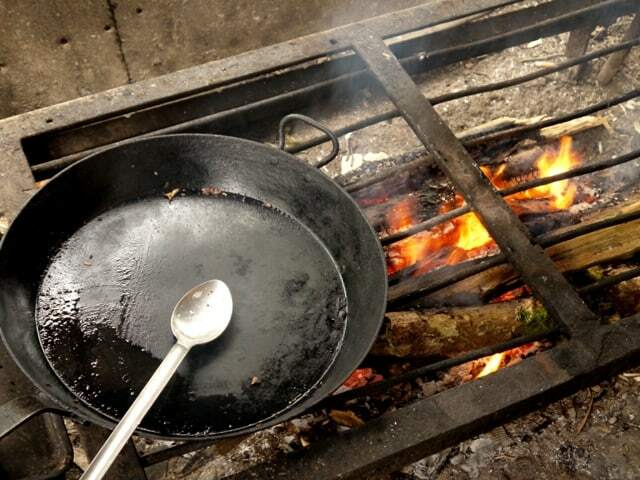 Something I would love to cook and eat straight as it comes off the fire. Seriously making me want to go camping just to cook yummy campfire bread like this. Hi Jane, looking at trying these this weekend on a Dads & Lads trip to the Lakes. We choose our campsites by the fact that we can have open fires to cook on, so these will be ideal. I’ll share some pics on Facebook afterwards. The flatbreads went down a treat with the boys (both making & eating), we did a batch of plain ones, then some with mixed herbs and finally a batch with garlic in them… all of them were yum, but the mixed herb ones were everyone’s fave.